My friend was celebrating her birthday at Cafe Salade de Fruits and I’ve always wanted to try it! It’s on 7th between Fir and Granville and it seems to be the only restaurant on the block. They have a small patio space on the sidewalk but the inside of the restaurant is small. We sat right next to the kitchen counter so we could see all the delicious food coming and going! I also liked how they have a large painting of TinTin and his dog on the wall. This entry was posted in Food Reviews, French and tagged duck confit, French, halibut, mussels, mussels and fries. 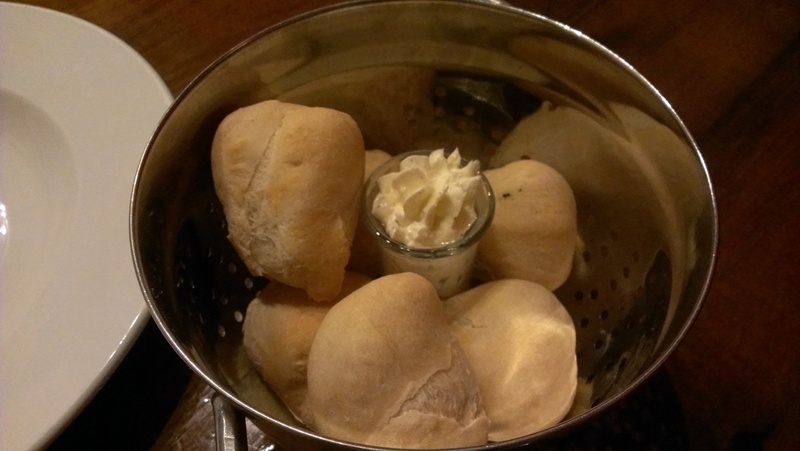 So I’ve been to Chewie’s for dinner a few times now so I thought I’d do a more comprehensive post! They have a new location near Coal Harbour that just opened this year. Also, I tried my first raw oyster last month!!! =O *gasp* yes what kind of a food blogger am I anyway? I just wasn’t interested before and it didn’t look that appealing to me but it turns out they’re not bad! 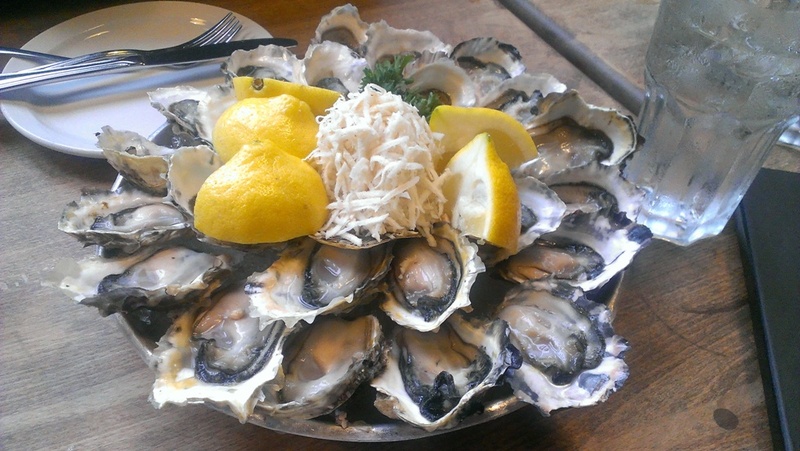 Yeah I don’t know why it took me so long to try them haha Chewie’s has a buck a shuck oysters from 3-6pm everyday! This entry was posted in Food Reviews, West Coast and tagged beef brisket, fried chicken, gumbo, jambalaya, mussels and fries, oysters, Seafood, shrimp. My friend and I were originally going to try Ask for Luigi to catch up but we realized they were closed on Tuesdays when we tried to make a reservation. Then I suggested Twisted Fork since I haven’t tried it yet and when we got there we realized it was Mussel Tuesdays! 1lb of mussels and fries for $8! That’s a great deal since it’s usually $16. 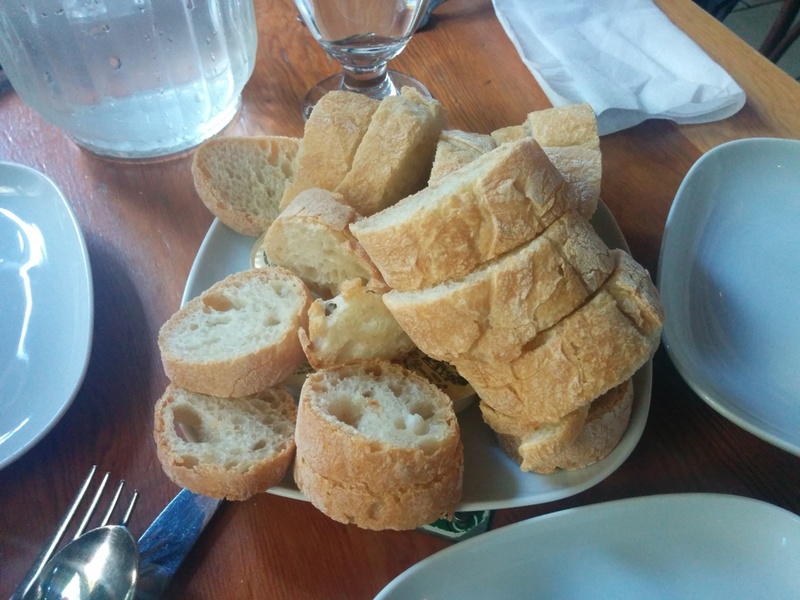 We received some complimentary bread with our meal and this was brought at the same time as our entrees. They gave us a generous portion for two people. 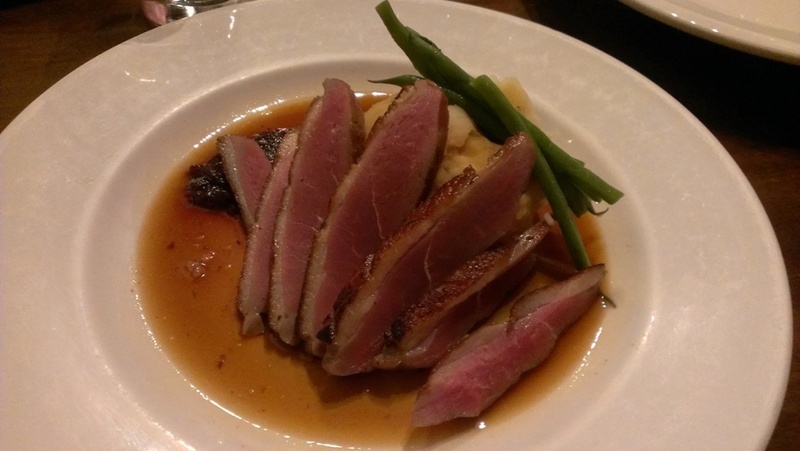 We shared the Cured BC Duck Breast with potato puree, green beans, cherry chutney and duck jus. The duck was not too salty but maybe it would be if I ate the whole plate. The potato tasted quite plain though even with the duck jus since the duck jus wasn’t that heavy. The beans were also rather bland so the duck was really the star of the show. It helped balance the flavours more. Here are the Mussels and Fries! This was actually my first time trying mussels and fries. My family just doesn’t eat mussels much so it just never appealed to me that much. I’m really glad we ordered it though! The mussels were served with a delicious cream sauce mixed with herbs and small pieces of tomato. The sauce was the best part! The fries were also delicious and tasted really good with the sauce too. In fact the sauce was so good we used it to give the potato puree from the duck entree some flavour! I’m definitely coming back for Mussel Tuesdays! Since this is the first time I’ve had mussels and fries I don’t have anything to compare it to but it was good for my first time! Moving on to dessert now! 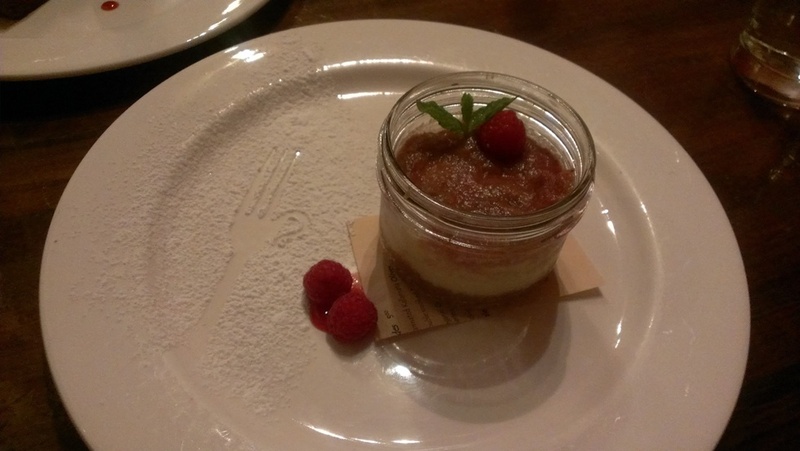 We also shared the Ricotta Cheesecake. It’s topped with strawberry rhubarb compote and mint and garnished with some raspberries. I love how they have the twisted fork design in the powdered sugar on the plate. Super cute. 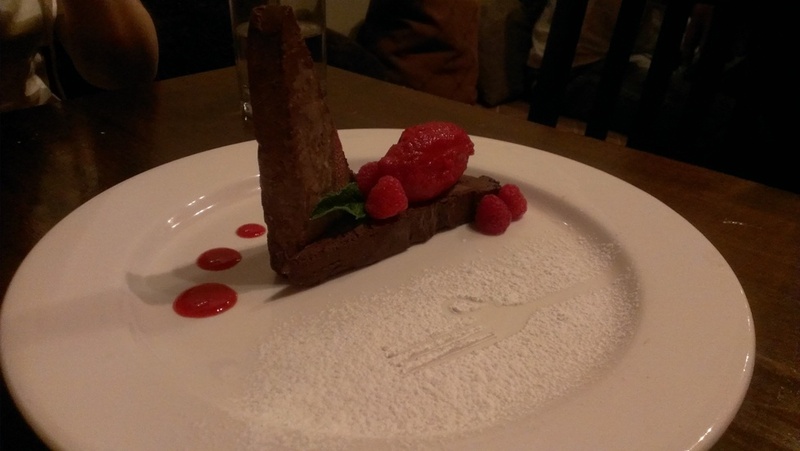 The cheesecake was quite light and the base was really soft too. The strawberry rhubarb blended in really nicely with the cheesecake. I was not disappointed with my visit! I’m going to introduce my friends to Mussel Tuesdays! Also please note if your whole party has not arrived yet they won’t seat you. We got this comfy corner at the very back and there were cushions and it was super cozy! 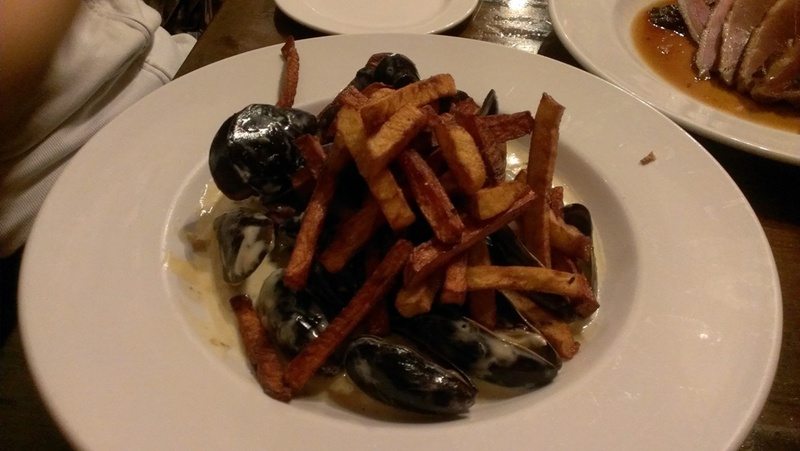 This entry was posted in Food Reviews, French and tagged desserts, mussels and fries.